This was a commissioned beaded necklace piece of work by a very dear friend for her darling sister. She wanted a fine long necklace in precious metal, peppered with tiny beads (preferably shiny). I decided to try to do that for her and go one step further if I could to make the piece truly unique - and I admit it, a bit more challenging (and interesting) for me. 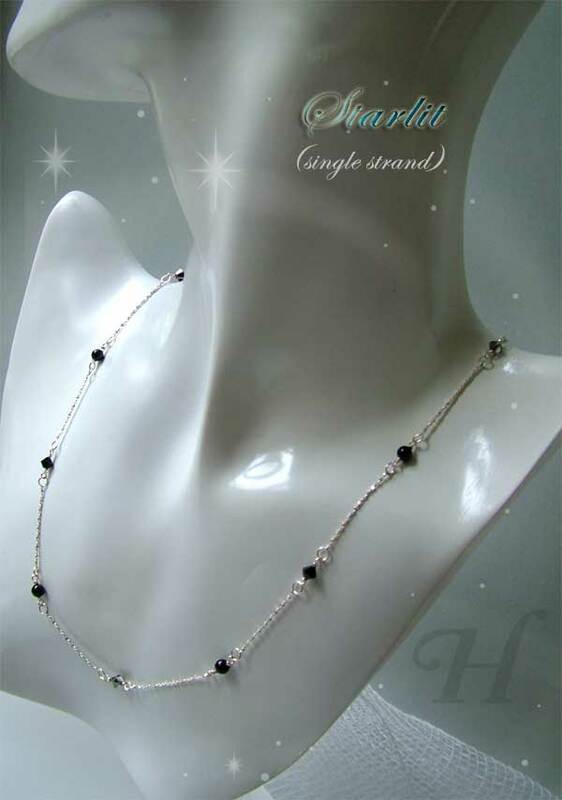 This wire work beaded necklace is created so that the wearer will have multiple styles to choose from, all in the one piece. It is made of 2 separate handmade chains, detachable one from the other, and both can be worn separately. They can be worn together as two separate pieces or together as one connected piece. 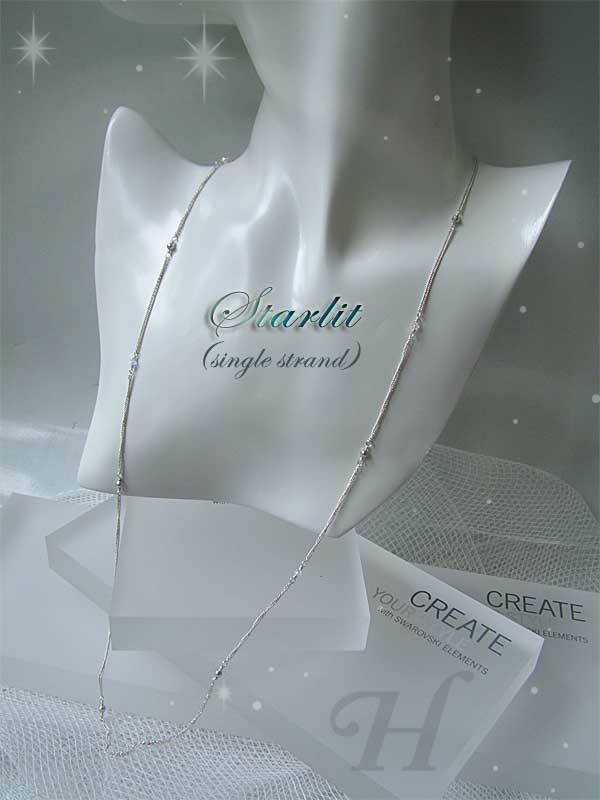 The main longer chain, with tiny Swarovski crystals can be worn with the focal (Swarovski Graphic bead) to the front or at the back. 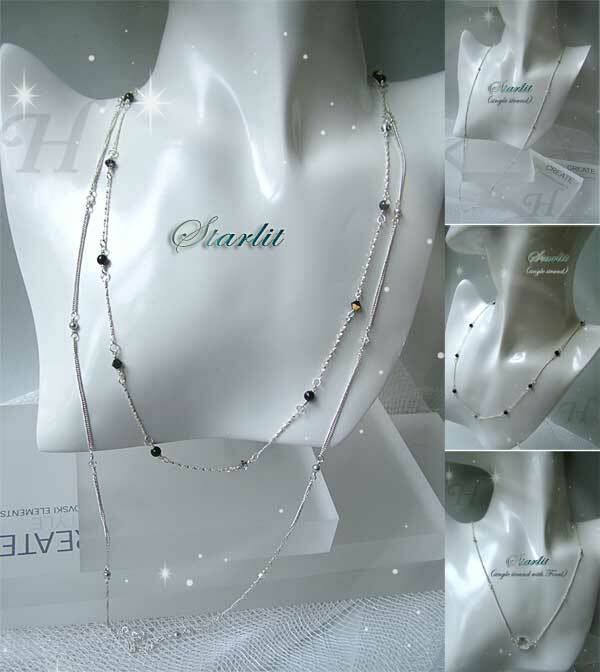 The large Swarovski Graphic bead is also used as the "clasp" of which the second chain can be attached. The following pictures will show all these much more clearly. The photo above here shows the two chains worn together. Again, these two chains can be worn as two separate pieces or linked together via the Sterling Eternity lobster clasps (aka Parrot clasps), as shown in the photo immediately below. 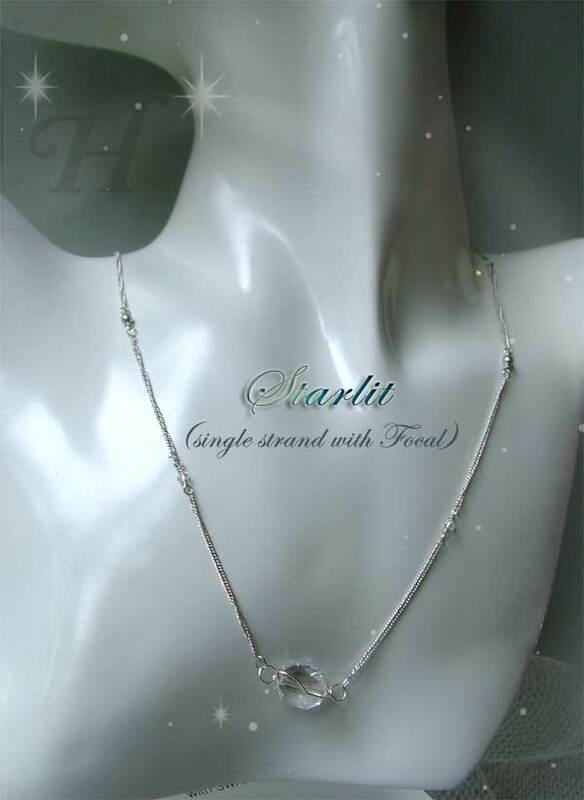 The longer chain is made with fine Sterling Silver chain, interspace with small (3mm) Swarovski bicone crystals (#5328, Crystal AB) and small (3mm) Swarovski Crystal Pearls (Light Silver). The specifications was for subtle tiny beads, with class, and distinctive sparkles but not obtrusive. This photo above shows the same chain worn with the focal bead to the front. In this photo I have shown it shorter than it really is only because this way, the piece can be photographed on the bust instead of hanging off it. One day I am sure I will get one of those taller busts needed to display long necklace pieces! 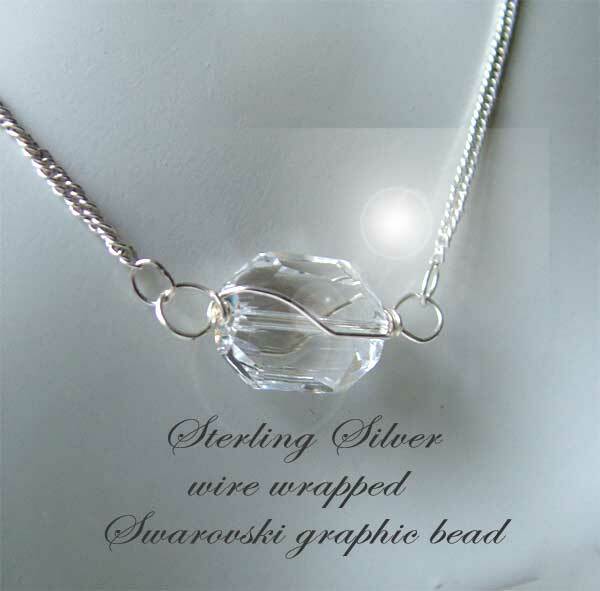 A close up of the lightly wire-wrapped Swarovski Graphic bead. 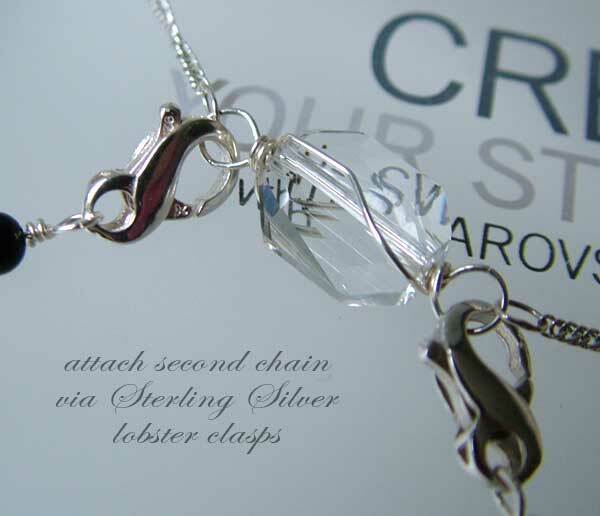 Using 24gauge (0.5mm) Sterling Silver wire, I lightly wire-wrapped the Graphic crystal bead so that it would have 2 loops at the end large enough to act as "focal clasp" for the lobster clasps to hook on. And at the same time, to leave it uniquely decorative enough to be the frontal focal piece when the long chain is worn by itself. 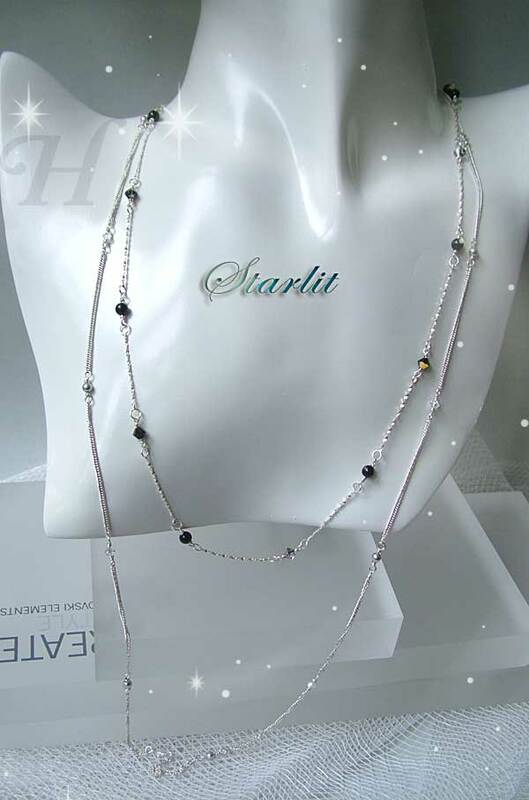 This second chain necklace is made with (different) fine Sterling Silver chain, interspaced with Swarovski bicone crystals (4mm, Crystal Silver Night) and Swarovski Crystal Pearls (4mm, Black). It can be worn separately by clasping one Eternity lobster clasp onto the other.